Check out our Pinterest board for more related resources! We’re slowing down for the summer! Instead of our usual roundup of “This Day in Geographic History” (TDIGH) events, here’s a closer look at one historic event that connects to something in the news today. We’ve also matched it with a map or visual, background information, and additional resources. 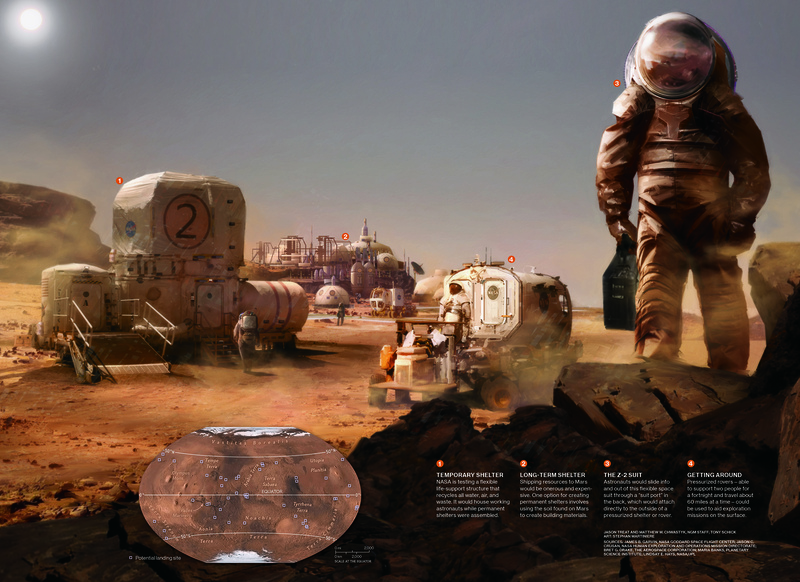 This graphic shows what colonizing Mars might look like, complete with a map of the planet. Artwork by Stephan Martiniere, National Geographic. In 1996 NASA scientists discovered bacteria inside a Martian meteorite, providing evidence that life may have existed on Mars. Earlier this year, President Donald Trump signed a bill confirming support for NASA and its long-term mission of sending humans to Mars by the 2030s. What would a settlement on Mars look like? If humans settle on Mars, what do you think the hardest part of adjusting to life there would be?